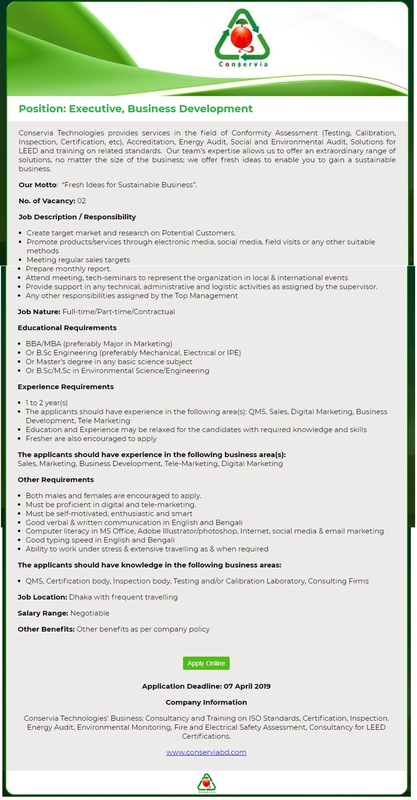 Conservia Technologies Job Circular 2019 has been published by their authority in daily online job portal and to get from the best jobs and the education portal website in BD Jobs Careers- www.bdjobscareers.com. For the user understanding, we would like to inform you that, Conservia Technologies provides services in the field of Conformity Assessment (Testing, Calibration, Inspection, Certification, etc), Accreditation, Energy Audit, Social and Environmental Audit, Solutions for LEED and training on related standards. Our team’s expertise allows us to offer an extraordinary range of solutions, no matter the size of the business; we offer fresh ideas to enable you to gain a sustainable business.